INDIANAPOLIS, IND. (EDUCAUSE) – October 28, 2015 – Today’s young adults are often criticized for turning to social media platforms like Facebook and Instagram for real-time feedback, but new research from McGraw-Hill suggests that this behavior could be a significant asset when it comes to studying with the help of technology. According to “The Impact of Technology on College Student Study Habits,” the third report in an annual series conducted by McGraw-Hill and fielded by Hanover Research, 87% of college students report that having access to data analytics regarding their academic performance can have a positive impact on their learning experience. 75% of students using adaptive learning technology report that it is “very helpful” or “extremely helpful” in aiding their ability to retain new concepts. 68% of students using adaptive learning technology report that it is most helpful in making them better aware of concepts that they do not know yet. Students reported that adaptive learning technologies are the most effective form of study technology, with 84% indicating a moderate or major improvement in grades. Technology increases engagement across the board: Students report that technology increases their engagement not only with course materials (77%), but with professors (64%) and fellow students (50%). Technology leads not only to better grades, but to improvements throughout students’ academic lives: 67% of students say study technology makes them feel better prepared for class; 57% report that it helps improve study efficiency; 46% report that it helps improve confidence; 45% report that it helps reduce stress. Eighty-four percent of students reported that technology helps their professors and teaching assistants to be more efficient and effective in teaching classes, and 86% agree that technology helps them to be more efficient and effective students. However, 86% of students feel that there are still ways that they could be using technology to make their education better, and 79% feel that there are still ways that their university and teaching staff could be using technology to make their education better. Sixty-seven percent of students found print textbooks with digital components to be “very helpful” or “extremely helpful” to their study process; 57% of students found print textbooks to be helpful on their own. 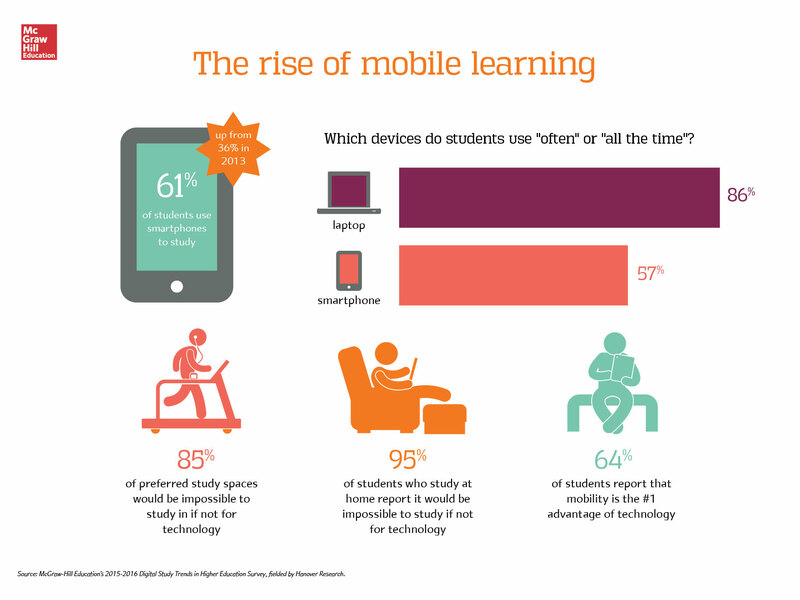 Almost two-thirds (61%) of college students report using their smartphones to study; year-over-year data collected from McGraw-Hill's own students demonstrate a 20% increase in smartphone-studying since 2014, and a 69% increase since 2013. On average, students report that 85% of their preferred study spaces would be impossible to study in if not for technology such as a laptop or smartphone. When it comes to total usage, laptops still rule: 86% of students report using laptops “often” or “all the time”; 57% of students report using smartphones as frequently. McGraw-Hill's report, "The Impact of Technology on College Student Study Habits," surveyed 2,657 college students aged 18+ who are currently enrolled in higher education institutions across the United States. Respondents were from a mix of majors and grade levels, ranging from freshman to PhD students. 2,107 of the students were selected from among a group of students that have previously used McGraw-Hill's technology in their coursework, while the remaining 550 were selected from outside of this group. McGraw-Hill is a learning science company that delivers personalized learning experiences that help students, parents, educators and professionals improve results. McGraw-Hill has offices across North America, India, China, Europe, the Middle East and South America, and makes its learning solutions available in nearly 60 languages. Visit us at mheducation.com or find us on Facebook or Twitter. Visit our News & Media Center for current contact information.